I have worked in the field of persistent pain for 8 years, I am continuously challenged. I get stuck and frozen by the complexity of presentations, because no two presentations are the same, despite the fact that those two very different presentations have a referral for the same pain problem (back pain for example). People experience pain in very different ways, which is why we can’t put people into buckets. Is it merely a fluke that people get better if you put them in the biomechanics bucket? In some cases it may be but there are many things that people will pick up on that you and I do not even realise. You’re first impression, the first words that come out of your mouth, how you are dressed, how you make people feel, your perception and attitude of the person the list is exhaustive. We cannot pin our confirmation on thinking that addressing biomechanics is the reason that someone has gotten better. However putting lots of buckets together can form an overall picture, think of it like a mosaic painting. Have a look at the painting below. It’s made from bottle caps. Now one of those bottle caps is just a bottle cap, but place them all together and you can see the famous self portrait of Vincent van Gogh. How many bottle caps were used to make the image..? Lots i’m sure! Would you agree that this painting is a complex network and interaction of layering, colour, communication and timing? Where one bottle cap starts another finishes. Each of those bottle caps serves a purpose, but some serve a more distinct purpose than others. Looking at the distinct bottle caps we can see a variation in colour, direction and layering creating an excitation of flow or inhibition of two colours to create a different part of the picture. This highlights specific features of the painting such as contours and characteristics – the nose, mouth, ears, facial hair etc. Deeper still it conveys something about the age of the person, the mood, the health. It can have an affect on how we feel about the painting – do we like it, do we feel disgusted by it, do we feel sad, happy, confused, threatened? Think of what would happen if we started to remove or add bottle caps, or if we moved the bottle caps to different parts of the painting? It would change the abundance of bottle caps or flow, resulting in a change in the excitation and/or inhibition of flow of the picture. Would the picture change completely? Would your perception of the picture change? We probably would not get the same response or reaction as our previous one. 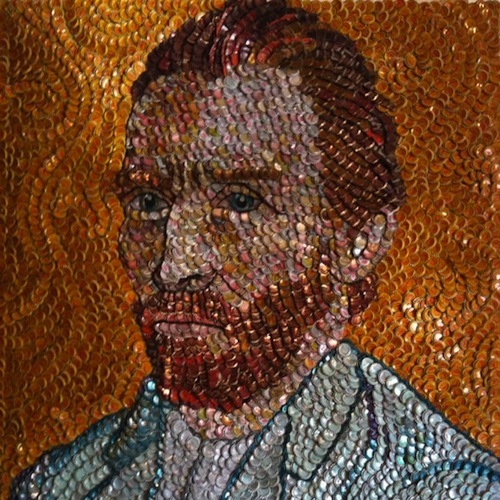 We could remove some of the orange caps and although we would still recognise that it is Van Gogh in the picture our perception of the painting might change. If we removed the bottle caps that made up the distinct features of the picture, such as the eyes, nose or hairline it would change significantly. It would create a very different response to that of what we initially thought. However we might be able to make out that it is still a person in the picture, perhaps on a warm day or in a bright room. I refer back to words previously mentioned of disgust, sadness, confusion, threat? Now let’s consider what goes on in the entire nervous system. A single nerve is a fascinating piece of bioengineering but it’s a single bottle cap. Place it in an entire nervous system it contributes to construct a picture. The nervous system is an intricate and complex interaction of layering, colour, communication and timing between billions of different nerves. Where one nerve starts another finishes. Each of those nerves serve a purpose and are specialised, yet, like some of the bottle caps that make up the body of the painting some are silent. The interaction of nerves and neurotransmitters form an excitation of flow and/or inhibition to create a movement or experience a response or sensation. Specific features of the movement, response or sensation can convey something about who we are, why we do what we do and how we do it. It can have an affect on us by making us feel sad or happy, disgusted, confused or threatened. Think of what would happen if nerves became more excitatory or inhibitory this would create more or less of a clearer picture of a particular movement, response or sensation that would change our perception. In the context of pain this may elicit a heightened or sensitised response. Like the painting removing or adding bottle caps, reducing or increasing inhibitory or excitatory actions of nerves can change how we perceive who we are, why we do what we do and our behaviour – how we do it. Hence why we need to think outside of the categorical box and consider the interaction of the many dimensions that will construct a persons perception of pain – the biopsychosocial model. I welcome you thoughts or any additional comments. This is my first attempt in dabbling in phenomenology. Like the many dimensions of pain science it is a particular interest of mine and always an exciting learning journey. Previous The Big Naked Pain and Brain Campaign: Extra extra!